On April 23, a ceremony of laying down two new frigates for the Russian fleet will be held at the Severnaya Verf plant in St. Petersburg; two large landing ships will be laid at the shipyard in Kaliningrad. This was stated by Russian Defense Minister Sergei Shoigu at a thematic conference call of the Ministry of Defense. – I will note that the indicated ships are planned to be incorporated into the Navy until 2025. They will significantly strengthen the ship’s shock groups of the far sea zone. – declared Shoigu. At the same time, the minister said, the Northern Shipyard will dock large blocks of the corvette of the 20386 series, which will be named Mercury in honor of the Russian fleet of the Russian-Turkish war (1828-1829). One frigate of Project 22350 is armed with 16 Caliber cruise missiles and is capable of striking a potential enemy both at sea and on land. 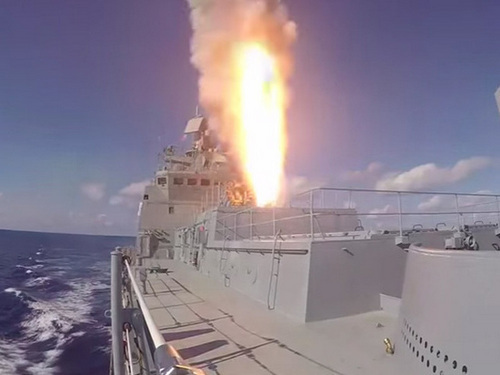 It is assumed that in the near future the latest hypersonic anti-ship missiles “Zircon”, whose adoption is expected during this year, will be installed on military vessels of this series. The famous poster-symbol of the Soviet Union with the slogan “Do not talk!” – on which the woman covers her mouth with her index finger, got modern “descendants”. A series of posters on the theme “Enemy Eavesdropping” began to appear in the Russian army. They depict episodes of the everyday life of soldiers and officers who may be of interest to foreign intelligence services. For example, seemingly innocuous conversation on a cell phone at headquarters can turn into a “drain” of information. Or a selfie made from a smartphone threatens to become the last photo for a soldier. 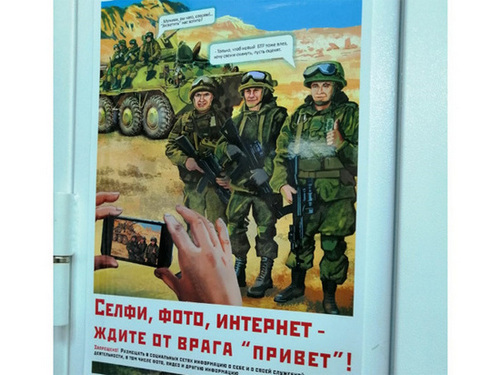 Particularly interesting is the series of agitplakatov, where a soldier takes pictures of his colleagues on a smartphone on the background of military equipment. Nearby is a visual explanation – the brand of the phone with which the photo was taken, as well as accurate geolocation data, up to the GLONASS / GPS coordinates. Thanks to them, it is easy to track the location of a military unit or unit and strike. According to representatives of the Ministry of Defense, smart phones easily send photos, geolocation, tags. All of this can threaten the country’s defense and even the personal security of a soldier, explains a representative of the security agency. Even a switched off phone is not a guarantee that your data and geolocation tags of places you visited a few hours ago will not “float” to the side. “Today, the technologies are built in such a way that even a switched off smartphone or tablet can transfer its geolocation somewhere“ to the side, ”says Sergey Dororodny, an electronics and IT device specialist, MK. – Usually it is completely safe and is not used by anyone. But with the military, the situation may be radically different. The expert adds that all the information about what he was doing or where he was during the “shutdown” the user instantly gets to third-party servers. Formally, cellular operators and holders of “cloud servers”, where photos, video and audio files are stored, guarantee confidentiality. However, no one is immune from “plum” on someone else’s order. This is especially important when you consider that most of the popular servers, “cloud servers” and sites are located abroad. There are also posters explaining the harm of using the office computer for personal purposes. Games, social networks and even simple recharging from a PC can be a danger to state secrets. With the help of special programs, professional “hackers” in the service of foreign intelligence are very easy to “get” all the information from the phone soldier. Recall, February 19, 2019 the State Duma in the third reading adopted a law that restricts the use of smartphones, tablets and other gadgets by military personnel. Now, the Russian military of all ranks and ranks will no longer be able to photograph, conduct audio and video recordings during working hours with impunity. The reason – modern gadgets without the knowledge of the owner are able to send secret data. For example, geolocation, with which it is very easy to determine where a photo, video clip or audio file was taken from.